The opening plenary included a presentation from David Sweeney, HEFCE, on the future landscape of UK research policy and funding. He urged our audience to use their voices and get involved in shaping and implementing reforms relating to British research. Next up Dr Conor O’Carroll, Chair, European Commission Steering Group on Human Resources and Mobility presented his update on open science and the implications for researcher development. The final speaker of the morning Prof Matt Lambon Ralph, University of Manchester, focussed on the ways to continuously attract researchers in a changing external environment specifically highlighting the range of PGR provision at his home university. We also updated our audience on the progress and future of the HR Excellence in Research Award in the light of Brexit, published our Vitae annual report 2015/16 and outlined the Vitae membership programme for the academic year focussing on four themes: Getting started in a new role, Planning ahead to manage your career, Work-life balance and Navigating the research environment. The results from reports were presented at the over-subscribed half-plenary session entitled: Research staff: experiences and talent management. This covered a range of topics from current policies and practice of funders in equality and practice of women in research, academic career breaks, career perspectives to institutional leadership development and improving the working environment. The other half of our audience focused on the careers of doctoral researchers, where we explored the issues of supervisor development, the research landscape of Europe, the HE White Paper and researcher engagement and considered how to provide equality of opportunity within large doctoral populations and different training structures. That plenary session ended with a presentation on the challenge of providing equality of opportunity across a diverse doctoral training landscape. As it is becoming our tradition, conference participants gave a particularly warm welcome that evening to the UK final of the Three Minute Thesis Competition (3MT®). Six brilliant finalists, competed live in front of our conference participants for the title of the UK 3MT® champion, by presenting their research on topics as diverse as the positive effects of learning a language on the brain, mapping drug routes into the brain, climate change, gene therapy, body image disturbance, as well as how characteristic features, such as beards, create bias making people misidentify others (e.g. in police line-ups). Chosen by our judges, the winner, Nazira Albargothy from the University of Southampton received £3K to spend on public engagement activity, sponsored by RCUK. Our People’s Choice Award, the opportunity to present her talk in the famous Royal Institution Faraday Lecture Theatre, funded by Speakeeze, went to Maddie Long from the University of Edinburgh. You can now view all semi-final and final presentations on our website. Day two of the conference was dedicated to ‘Challenging assumptions’ and was packed with fascinating talks on responsible research, citizen science as well as a thought-provoking talk on the gender dimension of research. In the first talk Professor Prof Jacqueline Broerse from the VU University Amsterdam presented interesting findings on the issues facing Responsible Research & Innovation (RRI) together with a framework of practices for engagement to embed in society. In another example of research being considered in the broader context of society, Lucy Robinson, from the Natural History Museum, explored the concept of ‘citizen science’ highlighting the benefits for research and the key factors to support researchers in its delivery. Our final presenter of the morning, Dr Elizabeth Pollitzer, Director of Portia introduced our audience to a head-spinning number of examples in which research and researchers are affected by gender inequality – reinforcing the need for gender equality to remain on the agenda. We were also delighted to introduce a ‘poster session’ to the conference, which proved to be successful in engaging participants in key areas showcased in an innovative, succinct ways. 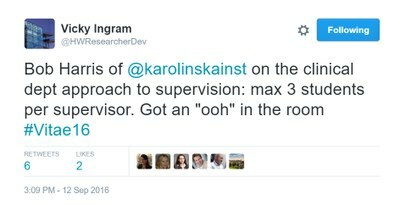 We expect this to be a regular feature at the conference going forward. A number of new Vitae resources were presented at the Vitae Conference. Our participants had an opportunity to pick up hard copies of the new 'What do research staff do next?' 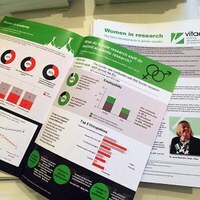 and our new 'Annual report', examples of our new resources for inductions, a new discussion paper on the audience of the Concordat to Support the Career Development for Researchers and 'Women in research' brochure with an informative infographic. Also available were leaflets on new Vitae resources and a programme of Vitae Activities for 2016/17. Our conference was amplified on the Twitter #vitae16 channel. Here all of those participants who are active on social media exchanged their views and shared links to interesting content. We have collated the #vitae16 feed in this Storify. 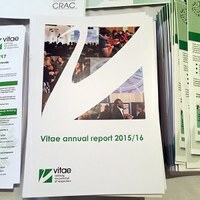 On the behalf of the entire CRAC/Vitae team, who worked tirelessly behind the scenes, we would like to thank our colleagues and all of those who contributed to yet another fantastic Vitae Conference, including our sponsors, exhibitors and media partner: Research Fortnight, who provided extensive coverage of the event. The presentations from the conference will be published on the Vitae website soon. We hope to see you next year in Birmingham, 11-12 September 2016!